What does a successful economy look like? Regular economic news coverage suggests that success is defined largely by growing U.S. Gross Domestic Product (GDP), expanding jobs, falling unemployment, and rising stock prices. While those trends have been underway for the better part of a decade now, many Americans do not seem to feel that the economy is working well for them. That’s in part because those headline indicators bypass more salient measures of worker and family well-being, like standards of living and household incomes. It’s also because national figures paint with a broad brush our $19 trillion, 320 million-person economy, which varies dramatically across the diverse communities where Americans live their daily lives. The Metro Monitor aims to deepen understanding of economic success by broadening its definition, and measuring it at the regional scale. This year’s edition explores trends in growth, prosperity, and inclusion (including by race) for the 100 largest U.S. metro areas, both for the latest year of complete data (2016 to 2017), and across a decade period (2007 to 2017) that illuminates how metro economies are performing today compared to before the Great Recession. Growth was widespread in 2017, but entrepreneurship declined over the decade. Prosperity rose in most places in 2017, but standards of living remain below 2007 levels in many metros. Most metro areas grew more inclusive in 2017, but earnings in many have yet to reach pre-recession levels. Metro areas made some progress on racial inclusion in 2017, but very little overall since 2007. 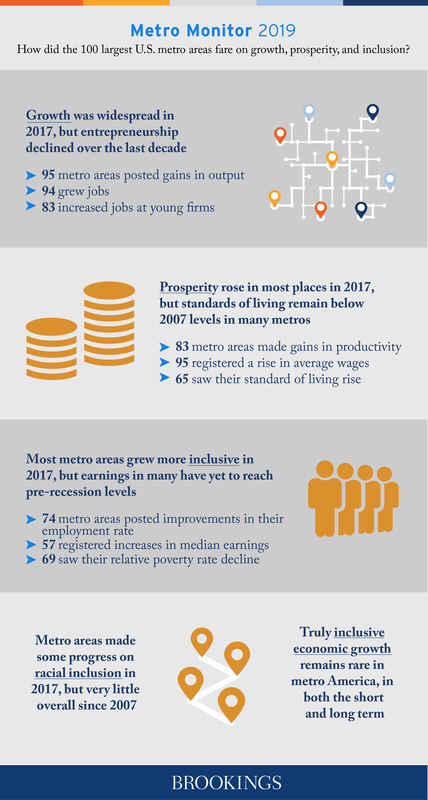 From 2016 to 2017, the number of metro areas making positive progress on all three indicators in each Metro Monitor category was: 77 for growth, 71 for prosperity, 24 for inclusion, and 24 for racial inclusion. Because relatively few metro areas made inclusion gains, just two—Charlotte, N.C. and Los Angeles—managed across-the-board improvements in growth, prosperity, and inclusion in 2017, while also shrinking disparities by race and ethnicity (not all of their improvements in inclusion and racial inclusion were statistically significant, however.) Notably, two metro areas fell just short of this group in 2017: San Diego experienced a slight decline in entrepreneurship, while Syracuse shed a small number of jobs. Overall, the trend indicates how inclusive economic growth still evaded most metro areas even as the national economy continued to expand strongly. Over the decade from 2007 to 2017, most metro areas (64) made progress on all three prosperity indicators, but only a minority did so on inclusion (29), racial inclusion (26), and growth (10). As a result, only one metro area—Denver—posted across-the-board improvements in all four areas. It boasted a growing, dynamic economy that boosted wages and standards of living, drew more people into the labor market, reduced poverty, and narrowed disparities by race and ethnicity (an additional four metro areas—Chattanooga and Knoxville in Tennessee, El Paso, and Los Angeles—made consistent progress in all areas except entrepreneurship, which fell in most metro areas from 2007 to 2017.) These relatively rare instances of inclusive economic growth demonstrate that even as most metro areas have rebounded to pre-recession levels of output, jobs, and living standards, other changes in the economy and labor market have mostly served to widen their gaps by race and income.